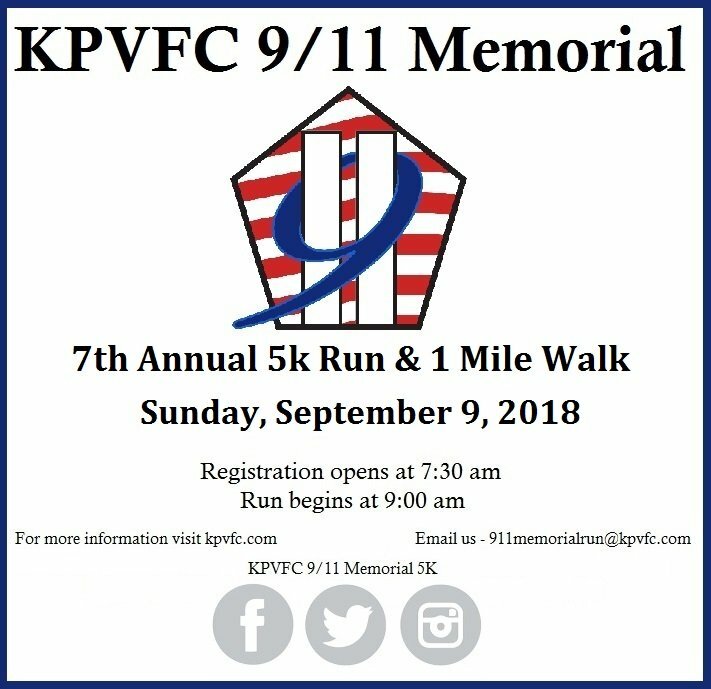 On Sunday, September 9, 2018 we will host our 7th Annual KPVFC 9/11 Memorial 5K. The purpose of this annual event is to help maintain the KPVFC 9/11 Memorial Run. This year, a portion of this year’s proceeds to benefit Addie’s Angels Addie is a 4 year old little girl who, in March 2018, was diagnosed with T-cell Leukemia. Addie is also the granddaughter of a past member of our ranks. We have increased our awards this year. We are now awarding to two, male & female, in each age bracket and special recognition for any male and/or female who runs in their turnout gear. NEW THIS YEAR – Team registrations with special pricing. Teams of 10 or more will be $20 per person. Awards for the top team (largest number of participants). Email us to set up your team! Amenities: The USATF Certified course, through residential King of Prussia neighborhoods, starts and finishes from the Fire House on Allendale Rd. There will be water on the course as well as refreshments at the finish. Our site allows for ample onsite parking for participants and visitors to join us for our event. Awards and a brief ceremony will follow at our 9/11 Memorial. Your pre-registration guarantees your shirt size availability. Day of registrations cannot be guaranteed availability of shirt size. Shirts for participants registering day of are only available only while supplies last.